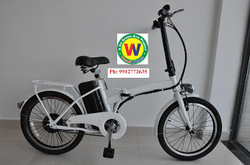 Foldable Electric Bicycle Manufacturing Company Located in S. Korea is Looking for Buyers in India. Please check and revert soon. You can find electric bicycles in this group will meet your requirments. Eco friendly battery operated e-bicycles, no license, no regn. We are providing a broad series of Electric Cycle to our customers. These products are developed utilizing the reliable material, sourced from reliable sellers of the market. In addition, experts test our provided products in order to deliver reliable series to our clientele. Moreover, we present this product at affordable rate. Our firm is offering an extensive series of 48v Battery Operated Cycle. Experts make this product as per worldwide industry values. In order to furnish the variegated desires of our clients, we have brought forth an extensive consignment of Electric Bike.